New York: Peter Blum Edition. Introduction by Peter Blum. This collaboration includes 40 full color reproductions, printed in actual size, of a group of over-painted photographs by John Beech and writing opposite by Edward Albee in response to each drawing, printed in his handwriting. It also includes a text by Edward Albee mounted in the book. Edition of 700, 104 pages, 40 color reproductions, hardbound stamped linen cover with binding screws. 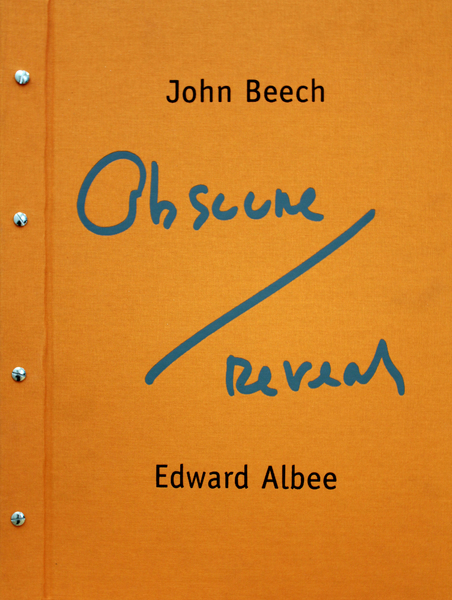 There is an edition signed by Beech and Albee available. Price upon request. There are also 40 copies of the edition specially bound in steel, signed and numbered by the artist and author, and includes an original drawing by John Beech. Price upon request.